We are the 4th Battalion of Artillery, Continental Line a living history group that portrays life in the military during the Revolutionary War. We are headquarted in Corunna,MI. The 4th Battalion of Artillery was an acutal unit of the colonial army that was formed in Pennsylvania. We have a fully functional British bronze 6 pound (weight of the ball)cannon cast from an original that was built during the French and Indian War period. 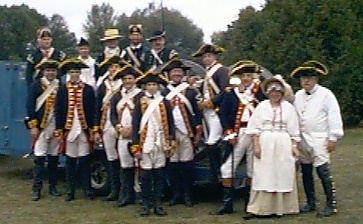 We participate in several reenactments and living history events every year in the United States and Canada. We are a non-profit organization that will also do special events for a fee. All our uniforms are exact replicas from the period of time we portray. Contrary to what Hollywood movie producers would have you believe, the cannons of this period did not fire exploding rounds. They fired a castiron ball or cannister shot. The lead ball was aimed at the center of the advancing enemy formation so that it would skip across the ground. The result was the lead ball would taking out the legs of the ground troops. It had quite a devastating effect as well as a psychological one. It was very common after a battle to search the field and retreive the balls so that they could be used again for another engagement with the enemy. The cannister shot was a tin cannister filled with lead musket balls and was fired at the enemy troops at closer range. Imagine the effect as that of a giant sawed off shotgun. The gunner of each cannon crew carried a spike and small hammer. The spike was similiar to a floor nail. If the artillery was about to be over-run by the enemy, the gunner would drive the spike down the vent (where the fuse is put), then the ramrod was driven down the cannon's tube to bend it. This prevented the enemy from turning the gun around and firing it at the retreating men. It would take anywhere from an hour or more to remove the spike from the vent. Life in the colonial army was very hard as the lack of funding prevented most soldiers from being properly uniformed for the winter season. The coats were made of wool and was very hot to wear during the warmer months. Food rations were also a problem. The military would often depend upon the generousity of the local people. Often, the soldiers' wives, known as camp followers would follow them. If a wife followed her soldier husband and he was killed, she quickly had to marry another or leave the camp. Orphaned boys were used as "powder monkeys". They would advance the powder charges to the cannon. On our trailor you see two British bronze guns. 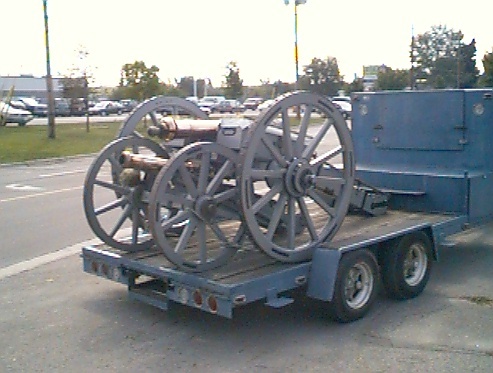 The smaller is a 4 pounder and belongs to the Lincoln Artillery, a Canadian group. The larger one is our 6 pound bronze gun. The weight of our gun is 1,800 pounds. 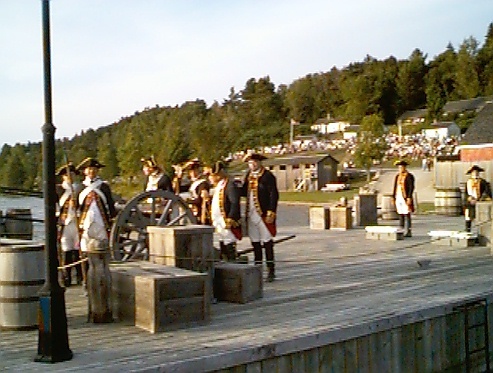 Sometimes the cannons were pulled by the crew instead of horses.